A fantastic Good Friday devotional, and one I highly recommend you make part of your library. Earlier [Jesus] had said to his disciples, “As the lightning flashes and lights up the sky from one side to the other, so will be the coming of the Son of Man. But first he must suffer many things and be rejected” (Luke 17:24-25). His triumph would be won, but only at greatest cost. Another other time, he said to the disciples, “1 saw Satan fall like lightning from heaven” (Luke 10.18), so we know that he had before him the vision of his victory; but it would come only through his suffering. Once, we are told, “while they were all marveling” at the wonderful things he did – the healings and exorcisms and miracles – he turned to them and said, “Let these words sink into your ears; for the Son of Man is to be delivered into the hands of [wicked] men” (Luke 9:44), but they could not believe it; it was completely outside anyone’s conception of the Messiah that he would be betrayed, condemned, and crucified. cified. Fleming Rutledge. The Seven Last Words from the Cross (Kindle Locations 466-470). Kindle Edition. It was cold, and the servants and officials stood around a fire they had made to keep warm. Peter also was standing with them, warming himself. Meanwhile, the high priest questioned Jesus about his disciples and his teaching. “I have spoken openly to the world,” Jesus replied. “I always taught in synagogues or at the temple, where all the Jews come together. I said nothing in secret.Why question me? Ask those who heard me. Surely they know what I said.” When Jesus said this, one of the officials nearby struck him in the face. “Is this the way you answer the high priest?” he demanded. “If I said something wrong,” Jesus replied, “testify as to what is wrong. But if I spoke the truth, why did you strike me?”Then Annas sent him, still bound, to Caiaphas the high priest. As Simon Peter stood warming himself, he was asked, “You are not one of his disciples, are you?” He denied it, saying, “I am not.” One of the high priest’s servants, a relative of the man whose ear Peter had cut off, challenged him, “Didn’t I see you with him in the olive grove?” Again Peter denied it, and at that moment a rooster began to crow. Then the Jews led Jesus from Caiaphas to the palace of the Roman governor. By now it was early morning, and to avoid ceremonial uncleanness the Jews did not enter the palace; they wanted to be able to eat the Passover. 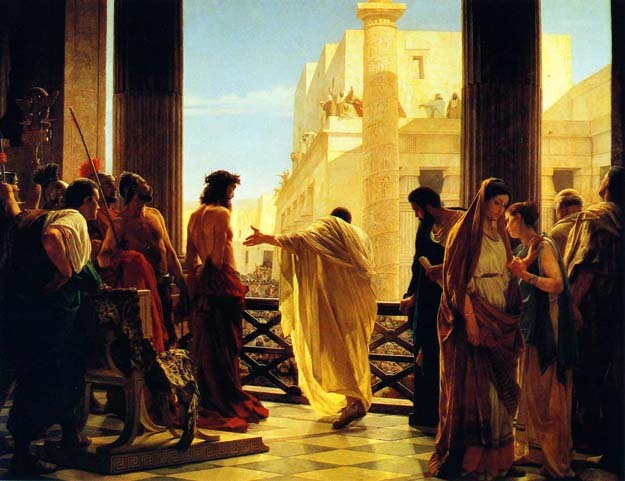 So Pilate came out to them and asked, “What charges are you bringing against this man?” “If he were not a criminal,” they replied, “we would not have handed him over to you.” Pilate said, “Take him yourselves and judge him by your own law.” “But we have no right to execute anyone,” the Jews objected. This happened so that the words Jesus had spoken indicating the kind of death he was going to die would be fulfilled. Pilate then went back inside the palace, summoned Jesus and asked him, “Are you the king of the Jews?” “Is that your own idea,” Jesus asked, “or did others talk to you about me?” “Am I a Jew?” Pilate replied. “It was your people and your chief priests who handed you over to me. What is it you have done?” Jesus said, “My kingdom is not of this world. If it were, my servants would fight to prevent my arrest by the Jews. But now my kingdom is from another place.” “You are a king, then!” said Pilate. Jesus answered, “You are right in saying I am a king. In fact, for this reason I was born, and for this I came into the world, to testify to the truth. Everyone on the side of truth listens to me.” “What is truth?” Pilate asked. With this he went out again to the Jews and said, “I find no basis for a charge against him. But it is your custom for me to release to you one prisoner at the time of the Passover. Do you want me to release ‘the king of the Jews’?” They shouted back, “No, not him! Give us Barabbas!” Now Barabbas had taken part in a rebellion. When Pilate heard this, he brought Jesus out and sat down on the judge’s seat at a place known as the Stone Pavement (which in Aramaic is Gabbatha). It was the day of Preparation of Passover Week, about the sixth hour. “Here is your king,” Pilate said to the Jews. But they shouted, “Take him away! Take him away! Crucify him!” “Shall I crucify your king?” Pilate asked. “We have no king but Caesar,” the chief priests answered. Finally Pilate handed him over to them to be crucified. When the soldiers crucified Jesus, they took his clothes, dividing them into four shares, one for each of them, with the undergarment remaining. This garment was seamless, woven in one piece from top to bottom. “Let’s not tear it,” they said to one another. “Let’s decide by lot who will get it.” This happened that the scripture might be fulfilled which said, “They divided my garments among them and cast lots for my clothing.” So this is what the soldiers did. Near the cross of Jesus stood his mother, his mother’s sister, Mary the wife of Clopas, and Mary Magdalene. When Jesus saw his mother there, and the disciple whom he loved standing nearby, he said to his mother, “Dear woman, here is your son,”and to the disciple, “Here is your mother.” From that time on, this disciple took her into his home. Later, knowing that all was now completed, and so that the Scripture would be fulfilled, Jesus said, “I am thirsty.”A jar of wine vinegar was there, so they soaked a sponge in it, put the sponge on a stalk of the hyssop plant, and lifted it to Jesus’ lips. When he had received the drink, Jesus said, “It is finished.” With that, he bowed his head and gave up his spirit. This is the Passion of the Lord. the world’s Victim to sustain. Is it nothing to you, all you who pass by? Look and see if there is any sorrow like my sorrow which was brought upon me, which the Lord inflicted on the day of his fierce anger. Holy God, holy and strong,holy and immortal, have mercy upon us. O my people, O my Church, what have I done to you, or in what have I offended you? Testify against me. I led you forth from the land of Egypt, and delivered you by the waters of baptism, but you have prepared a cross for your Savior. Holy God, holy and strong, holy and immortal, have mercy upon us. I led you through the desert forty years, and fed you with manna. I brought you through tribulation and penitence, and gave you my body, the bread of heaven, but you prepared a cross for your Savior. What more could I have done for you that I have not done? I planted you, my chosen and fairest vineyard, I made you the branches of my vine; but when I was thirsty, you gave me vinegar to drink, and pierced with a spear the side of your Savior. I went before you in a pillar of cloud, and you have led me to the judgement hall of Pilate. I scourged your enemies and brought you to a land of freedom, but you have scourged, mocked and beaten me. I gave you the water of salvation from the rock, but you have given me gall and left me to thirst. I gave you a royal scepter, and bestowed the keys of the kingdom, but you have given me a crown of thorns. I raised you on high with great power, but you have hanged me on the cross. My peace I gave, which the world cannot give, and washed your feet as a sign of my love, but you draw the sword to strike in my name, and seek high places in my kingdom. I offered you my body and blood, but you scatter and deny and abandon me. I sent the Spirit of truth to guide you, and you close your hearts to the Counselor. I pray that all may be one in the Father and me, but you continue to quarrel and divide. I call you to go and bring forth fruit, but you cast lots for my clothing. I came to you as the least of your brothers and sisters; I was hungry and you gave me no food, I was thirsty and you gave me no drink, I was a stranger and you did not welcome me, naked and you did not clothe me, sick and in prison and you did not visit me. O Lord Jesus Christ, Son of the living God, set your passion, cross and death between your judgement and our souls, now and in the hour of our death. Grant mercy and grace to the living, rest to the departed, to your Church peace and concord and to us sinners forgiveness, and everlasting life and glory; for, with the Father and the Holy Spirit, you are alive and reign, God, now and for ever. Amen. As you stand there [before the cross] in this strange, powerful mixture of recognition and horror, bring bit by bit into the picture the stories on which you have lived. Bring the hopes you had when you were young. Bring the bright vision of family life, of success in sport or work or art, the dreams of exciting adventures in far-off places. Bring the joy of seeing a new baby, full of promise and possibility. Bring the longings of your heart. They are all fulfilled here, though not in the way you imagined. This is the way God fulfilled the dreams of his people. This is how the coming king would overcome all his enemies. But then bring the hopes and sorrows of the world. Bring the millions who are homeless because of flood or famine. Bring the children orphaned by AIDS or war. Bring the politicians who begin by longing for justice and end up hoping for bribes. Bring the beautiful and fragile earth on which we live. Think of God’s dreams for his creation, and God’s sorrow at its ruin. —Wright, T. (2011). Lent for Everyone: Matthew Year A (pp. 137–138). London: SPCK. Here is an exquisite devotional piece on Jesus as he prayed in Gethsemane. See what you think (and pick up the book). Two generations ago, J. B. Phillips (best known for his translation of the New Testament) published a little book called Your God Is Too Small. It was a moving appeal for ordinary Christians to lift up their eyes and imaginations, and to realize that God is not simply a therapist, concerned with the humdrum, day-to-day matters of their personal lives and problems, but is the glorious sovereign of heaven and earth. We all need that kind of reminder on a regular basis. But there is, perhaps, a more subtle point which needs to be made as well. When people start to get the point about the sovereignty, majesty and glory of the one true God, it is often difficult for them at the same time to glimpse and grasp the real divine greatness which the gospel stories reveal. But if we don’t get this point, as well as the larger one, we will fall back once more into the mistake of James and John, celebrating the greatness of God and hoping that some of that greatness will rub off on us in the usual, worldly sense. All along in Mark’s book we have seen that Jesus is described as the one who, however surprisingly, is fulfilling the promises that Israel’s God will come back to his people at last, rescuing them and filling the world with his glory. Think back to the opening scene. Here is the preparatory messenger, here is the voice in the wilderness, and now here is the Coming One: my son, my beloved one, the one who makes me glad. Somehow, already, we have to get our heads around what Mark is saying: God promised that he would come back, but the one who’s come is Jesus, and Jesus is hailed by God himself as his beloved son. Mark offers no theory about how this makes sense. The earliest Christians didn’t theorize: they worshipped. They remained firmly monotheistic: Jesus wasn’t a ‘second god’ added to the one they’d already got. But, somehow, they found that worshipping Jesus and worshipping the one whom Jesus called ‘father’ went together. Not long ago, I heard a church leader declare that with this passage we actually see ‘conflict’ within the Trinity itself. (He was using this idea to justify continuing conflict within the church.) But Gethsemane is not about conflict. It is about love. This is the full, honest interchange of love in which the son lays before the father the true condition of his God-reflecting humanity, caught now in the necessary work of bearing the utter pain and sorrow of the world. But, people might say, doesn’t this prayer show that Jesus and his father are, as it were, on opposite sides of the equation? Doesn’t it appear that Jesus wants to be released from his obligation, but knows that the father wills it anyway? Not so fast. What Jesus’ prayer shows is the proper, right, natural reaction of any human being, and particularly the human being who completely reflected the life-giving God, to the dark forces of corruption and death. It shows that as Jesus went to the cross he was not doing it out of a distorted death-wish, a kind of crazy suicide mission. He continued, as one would expect from the life-restoring son of the life-giving father, to resist death with every fibre of his being. His very prayer to be rescued from it displays not a resistance to the father’s will, but a resistance to the forces of evil which result in death. There is no conflict here; only the deepest affirmation of the father’s will in all its aspects. And now we ask again: is your God this big? Big enough to come and take on the forces of evil and death by dying under their weight and power? There’s a hymn which has a verse beginning, ‘Jesus is Lord! Yet from his throne eternal, in flesh he came to die in shame on Calvary’s tree.’ There is one word there that is wrong. It shouldn’t be ‘yet’. It should be ‘so’. Jesus is Lord, and so, and therefore, he came into the world, came to his own people, came to the place of fear and horror and shame and guilt and evil and darkness and death itself. He came out of love, love for the father, love for the world. That is what Mark’s story is telling us. All the theologians down the centuries have produced formulae to explain this. But it’s all here, in a nutshell, within this astonishing story. And of course the disciples didn’t get it. First they fall asleep. Then they make a half-baked attempt to defend Jesus. And then—many people think this is Mark’s own signature, a shocking and shaming personal memory—one young man is grabbed by the tunic, so leaves the tunic and runs away naked. That says it all. Humankind, naked and ashamed in the garden, while the snake closes in for the kill. The son of man has arrived at the place where the problem began, to take its full force upon himself. Lord Jesus, King and Master, help us to watch with you, to stay with you, to learn from your anguish the lessons of love. —Wright, T. (2012). Lent for Everyone: Mark, Year B (pp. 151-155). London: SPCK. The happy commemoration of today’s feast with its immense concourse of people invites us to prolong fervently our praises of the Most Holy Body of Christ. What could be sweeter, what more pleasing to the heart of the faithful than to exalt the abyss of his divine charity, and to glorify the overflowing torrent of his love! At the table of the new grace the hand of the priest distributes ceaselessly his Flesh as food and his precious Blood as drink, to those who are his children and heirs of the kingdom promised by God to those who love him. O endless Emanation of the goodness of God and of his immense love for us, admirable and worthy of all praise! In this sacrament, where all former sacrifices are done away with, he remains with us to the end of the world; he feeds the children of adoption with the bread of angels and inebriates them with filial love. This is the food and drink for the elect, living bread and spiritual nourishment, remedy for daily weaknesses! It is the table which Christ has prepared for his friends and guests, like the one the father prepared for his son on the day of his return, to replace the symbolic lamb. This is the Passover in which the victim immolated is Christ; 0 Christ our Passover, you want us too to pass over from vice to virtue; as once you delivered the Jews, so now you set us free in spirit. You are the food that satisfies all but the most hardened; food that is eaten by faith, tasted by fervor, assimilated by charity. 0 viaticum of our pilgrimage, you lead travelers to the height of virtue. Confirm my heart in good, assure it in the paths of life, give joy to my soul, purify my thoughts. The Eucharist is bread, real bread; we eat it without consuming or dividing it; it converts but itself is not changed; it gives strength without ever losing it; it gives perfection and suffices for salvation; it gives life, it confers grace, it remits sins. It is the food of souls, a food which enlightens the intelligence of the faithful, inflames their hearts, purifies them from their shortcomings, elevates their desires. O chalice that holy souls love to drink of, chalice of fervor, chalice changed into the Blood of Christ, to seal the new Alliance, withdraw us the old leaven, fill our souls with yourself, that we may become a new paste and that we may go to the feast with the unleavened bread of sincerity and truth. For the Lamb without spot, who knows no touch or stain of any sin, ought to be eaten with unleavened bread. We should not approach without being cleansed by confession, without having a solid foundation of faith, without being in charity. Come to the Lord’s supper, if you wish to come to the nuptials of the Lamb; there, we shall be inebriated with the riches of the house of God we shall see the King of glory and the God of hosts in all his beauty, shall eat this bread in the kingdom of the Father.